Long standing followers of The Frustrated Gardener will know that I have something of a crush on hollyhocks (Alcea). So it was no surprise when my heart went all aflutter at the sight of The Botanic Nursery exhibit at Hampton Court last week. In previous years there have been a handful of hollyhocks incorporated into the Wiltshire nursery’s display. This time the objects of my affection took centre stage amongst other lime tolerant plants and the nursery’s speciality, foxgloves. My fondness for hollyhocks stems from my childhood. At my parents’ home near Bath they excelled, planted along a south facing verandah between lanky roses such as ‘Queen Elizabeth’, ‘Golden Showers’ and indestructible ‘Frensham’. Unlike the roses our hollyhocks were not named cultivars, just unplanned crosses and cheap seed strains. This didn’t diminish the allure of their crinkled petals in shades of lemon, hot pink and wine red. The colours drew me towards them like a bee to their plentiful pollen. I would always wait for the seed to ripen and collect it for sowing the following spring. Then the dreaded rust struck and our hollyhocks never quite regained their looks or vigour. 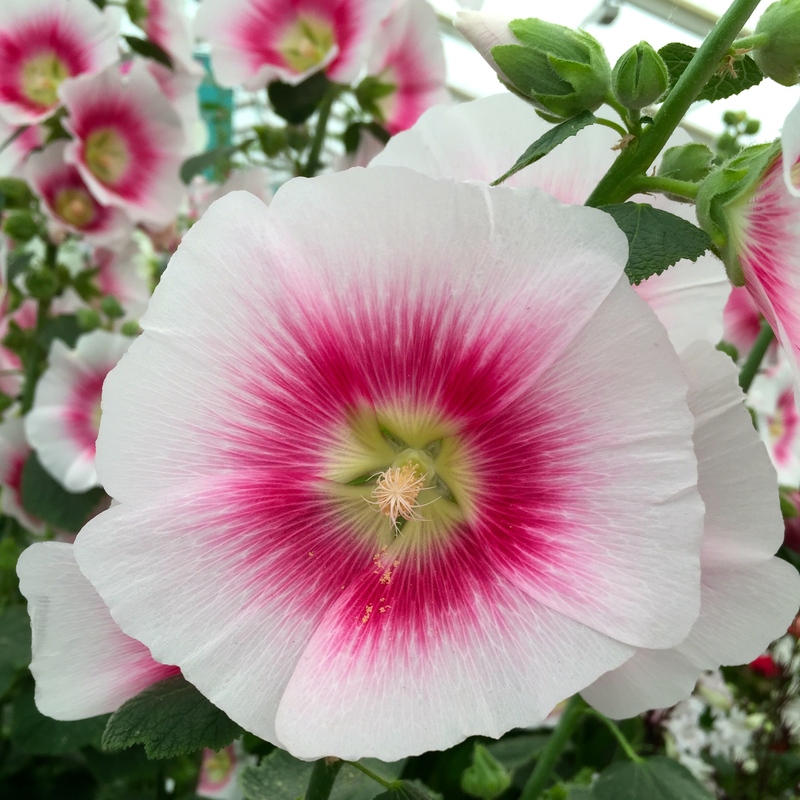 Over the 500 or so years since hollyhocks were first introduced to England from South Western China, breeders have trawled the trial beds for varieties with sumptuous plain, bi-coloured and fully double flowers. Modern hybrids are more resistant to rust than the old, cottage garden strains that rapidly lost their lower leaves to fungal infection. There are even dwarf strains of hollyhock although these seem rather a contradiction to me. 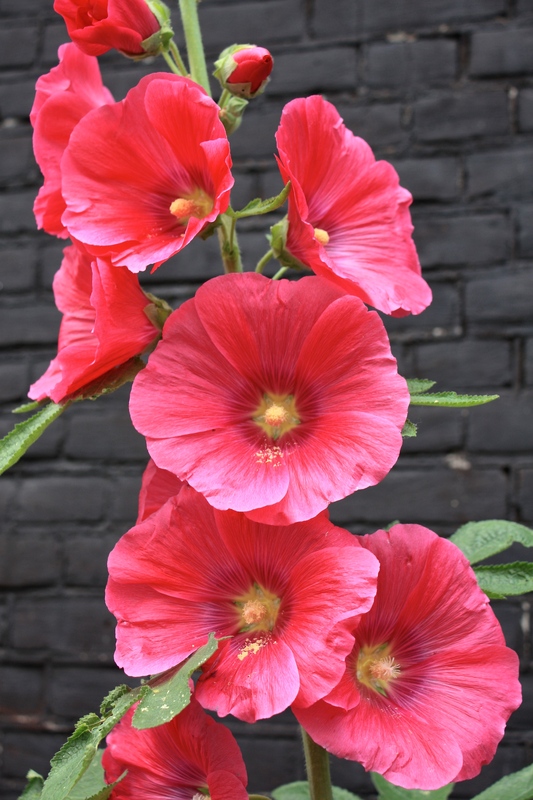 Thankfully most modern hybrids have retained the hollyhock’s naturally lofty stature making the plant a perfect choice for growing against a wall or at the back of the border. 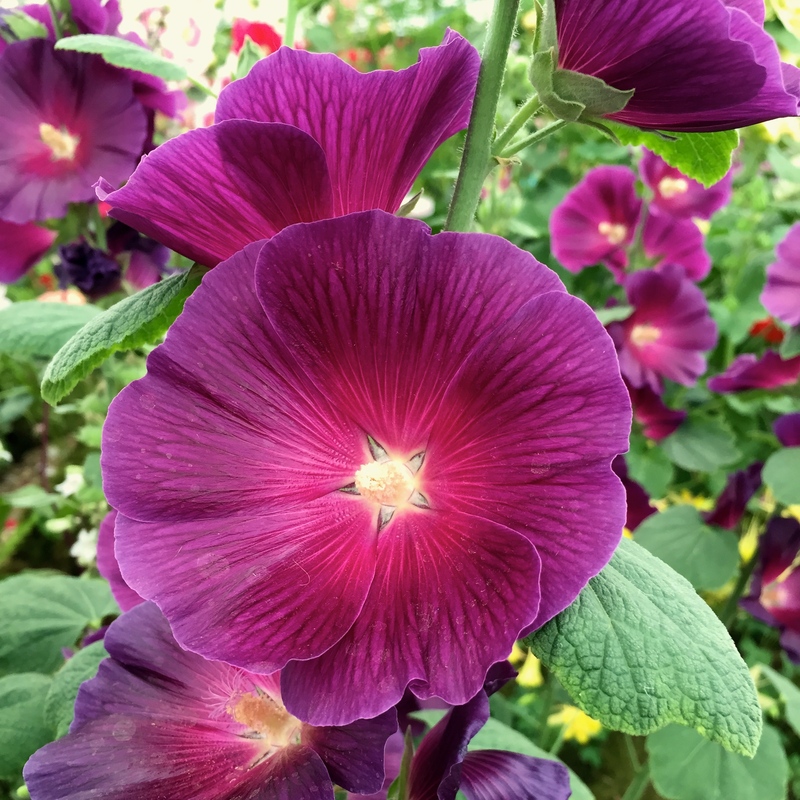 Treated as biennial or briefly perennial plants (they tend to be short-lived), hollyhocks have such an innate sense of place that it’s rare to see one growing where it ought not to. Such is their screening appeal that the seed strain known as ‘Indian Spring’ was once dubbed the ‘outhouse hollyhock’ because the flower stems were tall enough to hide anything that the householder didn’t wish to be seen. Happy growing in a pocket of soil at the foot of a wall or between paving stones there is surely room for a hollyhock in every garden. 1) Alcea rosea ‘Nigra’ – the classic black heritage hollyhock. Dark and velvety like Tulipa ‘Queen of the Night’. 2) Alcea rosea ‘Spotlight Sunshine’ – a clear yellow cultivar which mingles well with whites, pinks and purples. The spotlight series of hollyhocks is the result of 18 years of German plant engineering and claims to be fully perennial. 3) Alcea rosea ‘Halo Apricot’ – this hollyhock made it into my Top 10 plants at Hampton Court back in 2012. The Halo series was introduced by seed merchants Thompson and Morgan. Each hybrid has attractively bi-coloured flowers. This is one, with it’s fig-like leaves, is of my favourites. 4) Alcea rosea ‘Appleblossom’ – developed by William Chater (1802-1885), Chater’s Doubles were the first reliably double hollyhocks available on the market and they are still going strong today. Appleblossom, as you might expect, is an attractive soft pink. 5) Alcea rosea ‘Créme de Cassis’ – another double, this time with ruffled flowers the colour of stewed blackcurrants rippled through cream. Delicious. Gorgeous photos, love the hollyhocks. I have grown ‘Nigra” in the past here at home, but by the time it blooms, there are usually no leaves left. Between the rust and the insect larvae that skeletonize the leaves, all that was petiole and flowers. At the garden where I work, there is a reseeding mixed old variety that has pink/orange/apricot/red flowers. It too suffers from disease and insects but manages to flower. 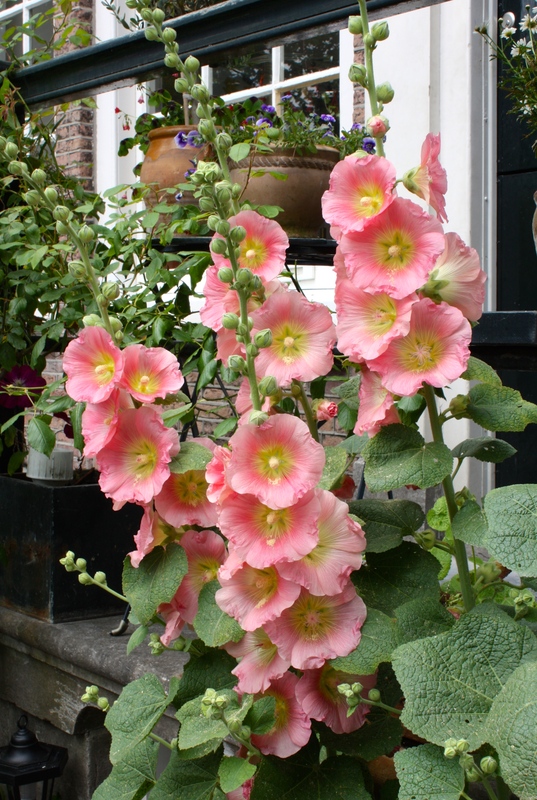 Yes, hollyhocks can be troubled when it comes to pests and diseases which is such a shame. Your old variety sounds marvellous, even minus leaves! 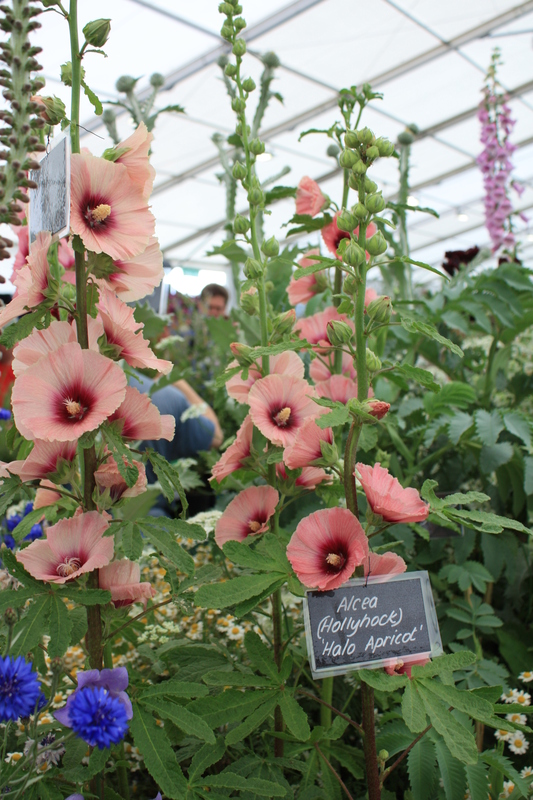 I agree, I love them too.I thought they looked wonderful on the stand at Hampton Court with the Digitalis. Have you come across the wonderful xAlcalthaea suffrutescens ‘ Parkallee’? It has creamy leaves that don’ t get rust and creamy apricot flowers. It is sterile but if you would like a bit I will root a cutting for you. No trouble, I will be in touch when I have got a rooted piece. Very beautiful flowers. I’ve tried Hollyhocks in the past. They’ll do well one year, then are barely there the next. Wish I had your green thumb with them! Many are best treated as biennials so that may be why they don’t come back. It is said that some colours do better on clay soils and others on sandy soils, but not sure how true that is. I hope you try again one day. I adore hollyhocks. They always used to pop up between the edging stone and pathway in my garden in Esher; way too tall for that position but I could never bring myself to pull them out. They are just gorgeous. Hi I just love Hollyhocks. You have such lovely images of theses flowers and more. I’ m a painter and I wanted to know if I have permission to paint one of you hollyhocks image. Please let me knoe via my email. Dear Frustrated Gardener. Can you tell me if double hollyhocks have a tendency to have sterile flowers?